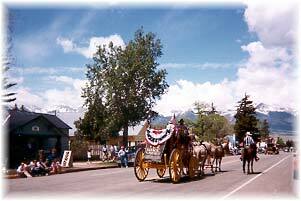 Established at the base of The Sangre de Cristo Mountains (the Worlds longest continuous mountain range), and within the Wet Mountain Valley lies the historic mining towns of Silver Cliff & Westcliffe, Colorado. Elevation approximately 8000 ft. This B & B is Closed for renovation. Recommended by CBS Channel 4 Colorado Getaways! Featured & Photographed in John Fielder's Best of COLORADO. Showcased in the Travel Section of The Sunday Denver Post. 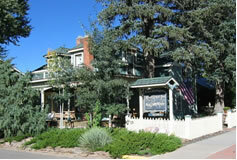 "If you're looking for an award winning lodging experience, visit us at the Main Street Inn B&B. It's not just about the fresh mountain air....but the easy atmosphere of a rural community. It's also about a historical house renovated with precision and care...where the charm of the past links with the comforts of today for tomorrow's memories. After all, pleasant moments last a lifetime. 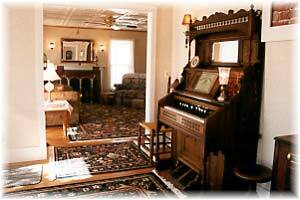 So, if your passions are history, comfort, or serenity....give yourself a gift to the Main Street Inn B&B. Welcome back....to a friendly time and a cozy place." During restoration, clues revealed a portion of the house dated to the Silver Cliff mining era of 1880. The original Silver Cliff owner of the house was Alonzo Peters. In 1886, he purchased one parcel of land in the newly established town of Westcliffe for $25 from the Clifton Company, a.k.a. the railroad. It is believed that the Silver Cliff built house was "rolled" down on wagon wheels to its current Westcliffe location, possibly to escape the water bond tax imposed on Silver Cliff residents. Between 1886 and 1893, Mr. Peters purchased two more adjoining lots, and constructed some out buildings behind the house. The property was purchased in 1893 by George B. Beardsley, an early mayor and the local banker of Westcliffe. During this ownership, the house was enlarged and the "gingerbread" trim and detail you currently see on the property today was added. After Beardsley's death in 1924, he left his estate to his two children who eventually sold the homestead to Otto and Laura Elze in 1943. Through the years, several attempts to "update" the house had been made, but it eventually fell into disrepair. Main Street Inn Bed and Breakfast, LLC purchased the property in 1998. 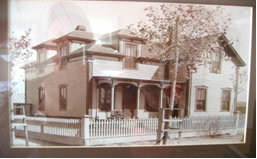 In renovating the house, extra effort went into restoring the house back to its 1900 turn of the century look. 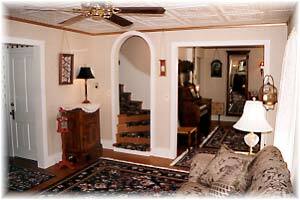 This included such things as moving the front entrance back to its original location, replicating the outside trim detail, reviving original hardware to their luster, and saving the chimney flues. Additionally, updating the house included extensive foundation work, new heating, electrical & plumbing systems, and the addition of several bathrooms. Every effort was made to combine yesterday's charm with today's comfort. The Main Street Inn offers five unique and distinctive accommodations, but only one standard of quality. Memorial Day Parade on Main Street. In full view of our porch. 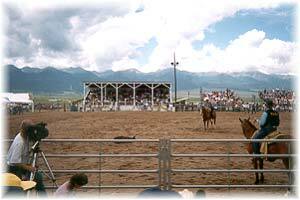 Custer County Fair & Rodeo in July. Within walking distance from the B&B.